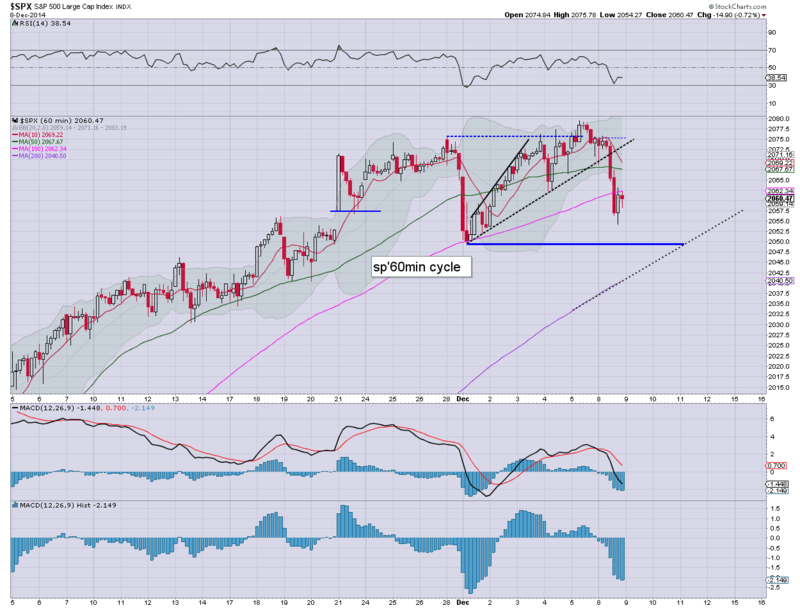 US equity indexes were increasingly weak as the day progressed, with the sp'500 settling -15pts @ 2060. The two leaders - Trans/R2K, settled lower by -1.3%. 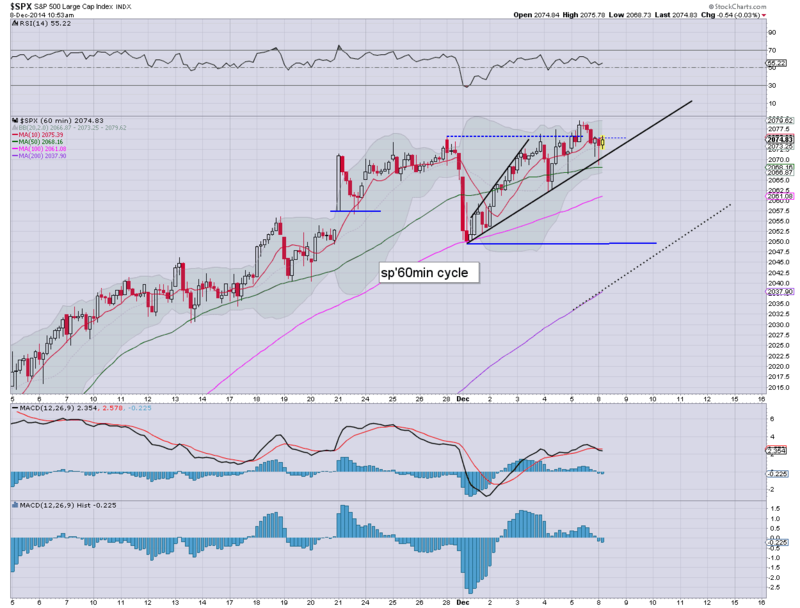 Near term outlook is for a minor retrace.. at best.. sp'2020/1980. A day for the equity bears... but still, even if it is a retrace, market won't fall much more than 2-3% before the broader uptrend resumes. US equities remain broadly weak, with more significant declines for the two leaders - Trans/R2K, lower by -1.3% and -1.1% respectively. Energy prices remain under severe pressure, Nat' gas -4.9%, whilst Oil -4.0%. VIX is higher by a notable 17%. *the above fib retrace chart assumes a short term top of sp'2076, but I have LOW confidence that a retrace is even underway. There have been many teases like this across the last few weeks. Ironically, it will only be once there is confidence/clarity, that we'll probably have seen 80/90% of the pull back anyway. So... we'll close in the red today, and next target for the bears should be a daily close under the recent low of sp'2049. That seems possible tomorrow. At best... a pull back to 2020/1980 zone. In the scheme of things... its all minor noise. The fact that USD continues to increasingly coo todal, -0.3%.. is not doubt helping metals. US equities have turned lower, with borderline significant declines across most indexes. 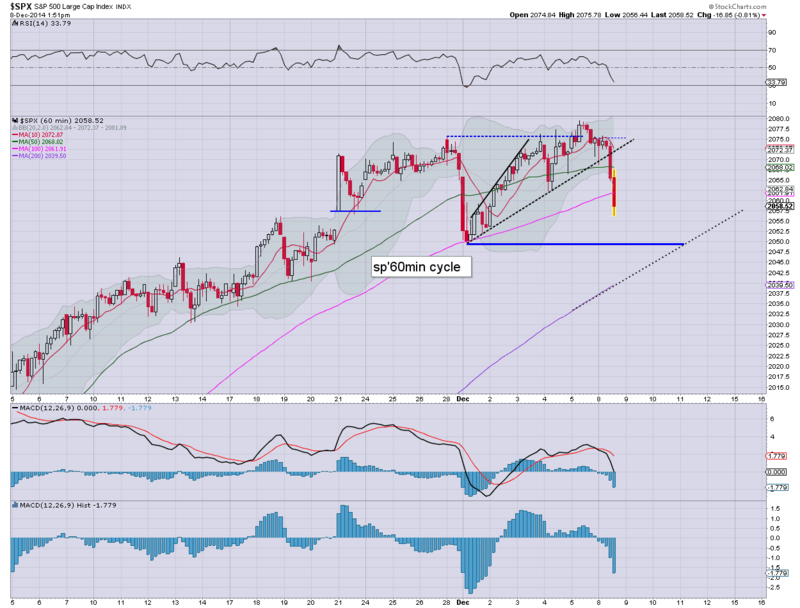 First soft target is the recent intraday low of sp'2049. If that fails to hold, then it opens up 2020/15 zone. At best.. equity bears could make a play for 2000/1980.. but recent price action argues strongly against the latter. 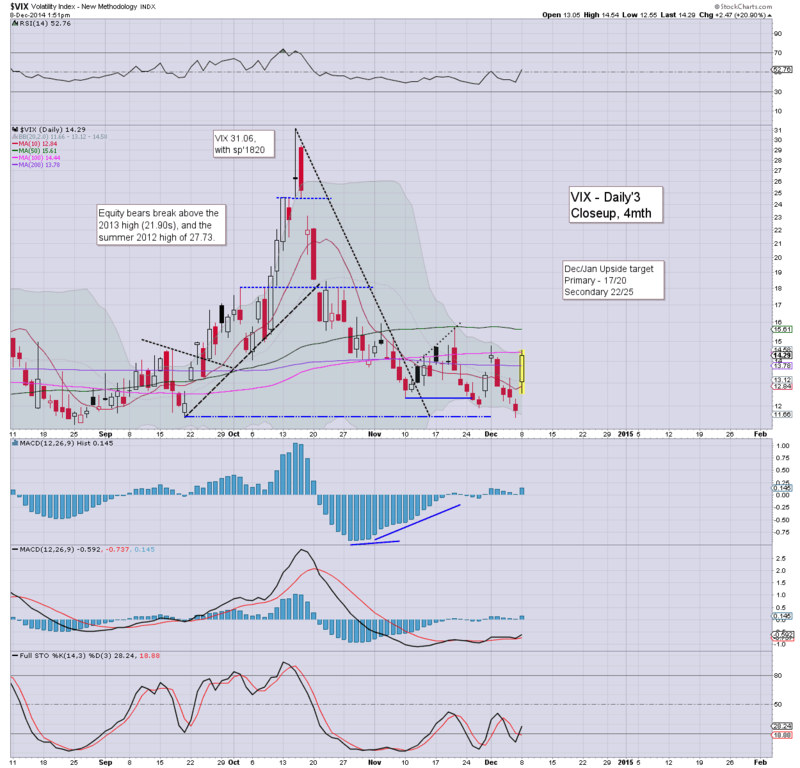 *a rather notable gain of 21% for the VIX, but then... 21% of a small number.. still makes for a low VIX. So.. we're seeing some weakness, and bears should be seeking a daily close <2049... but that won't be easy. Regardless.. a retrace.. if thats even what it is... is all it will be. 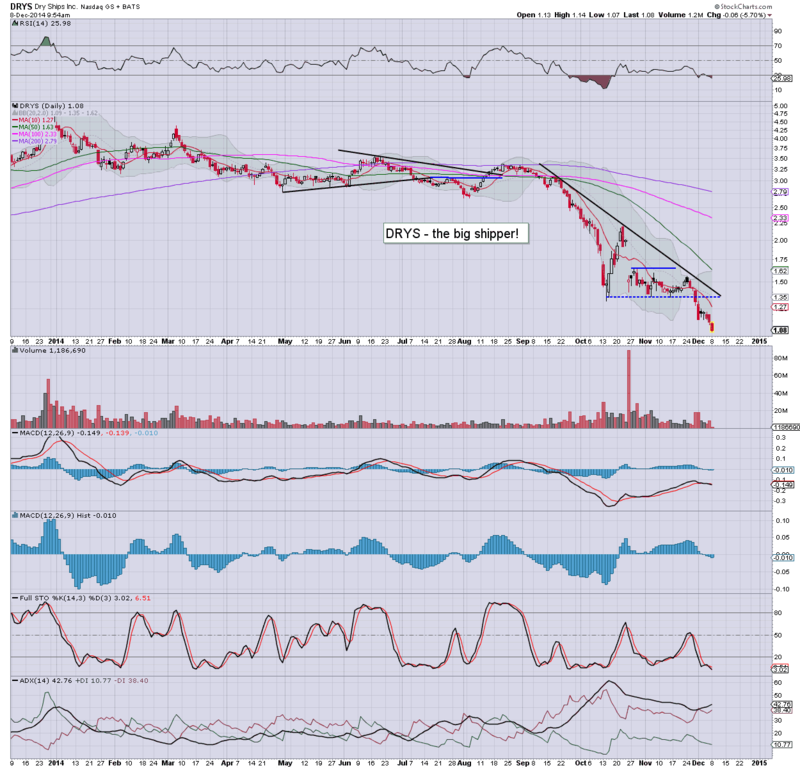 BTU -6% @ $8.30s... headed for $5.. which should be a key multi-year floor in early 2015. 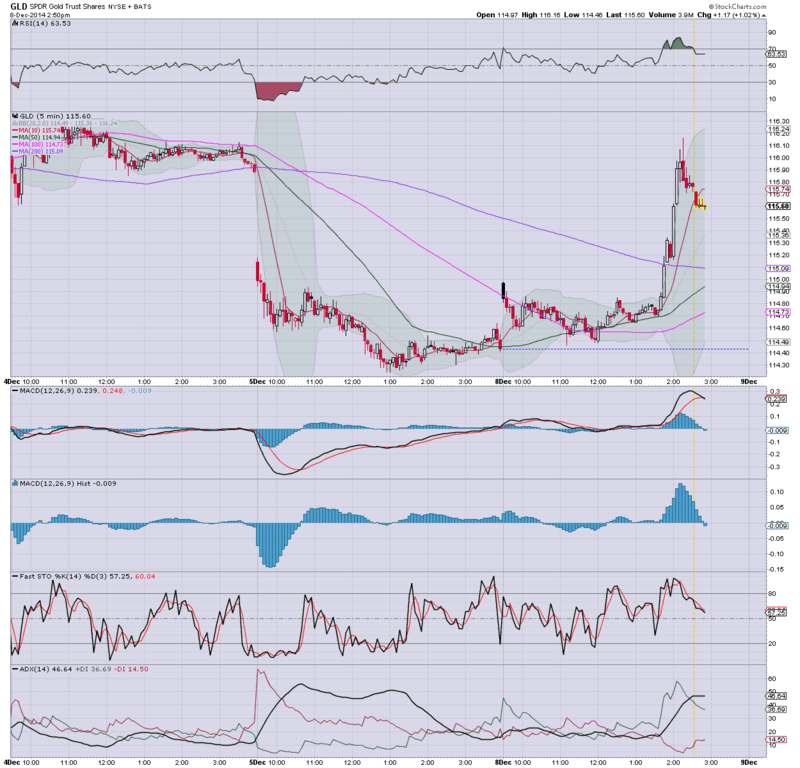 TWTR -5.9% in the low $36s., with a viable floor of $30 before next earnings up wave. 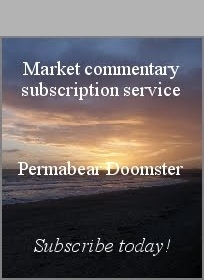 Whilst the broader equity market will surely remain in micro churn mode for the rest of today, there remains severe weakness in the Energy sector. Energy prices are in collapse mode, Nat' gas and Oil, both lower by around -4%. *whilst the broader market is basically flat lining, I'll merely highlight individual stocks. Incredible price levels in the usual suspects... SDRL, RIG, BTU, CHK... carnage.... as Mr Market starts to price in $50 oil. 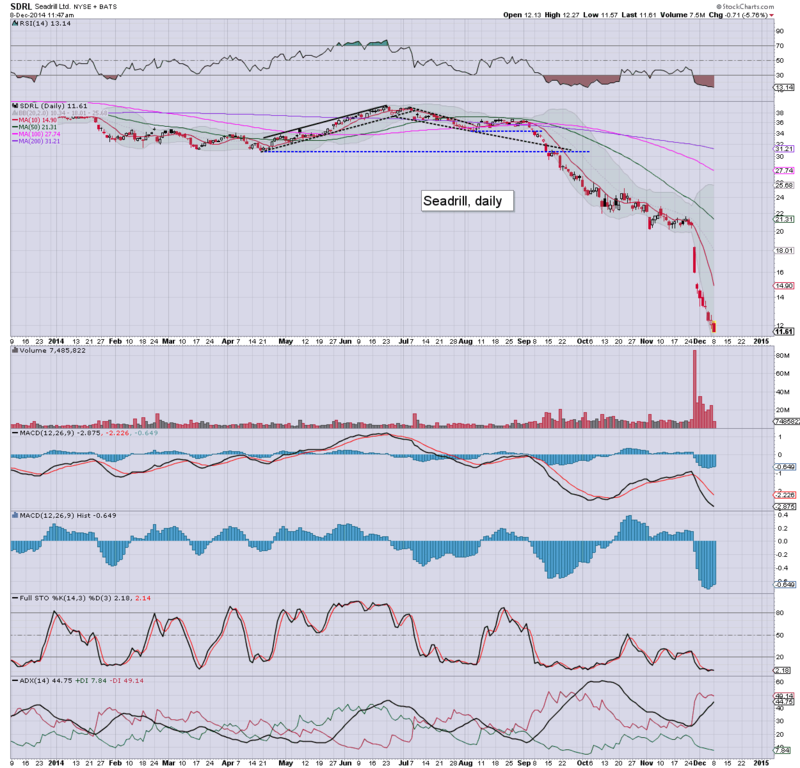 Notable weakness, DRYS -23% @ $0.87, on news it has repaid convertable notes. Isn't that good news though? The opening equity weakness has already been negated, with many indexes turning fractionally positive. Energy prices remain exceptionally weak, Nat' gas -3.5%, whilst Oil is -2.9%. VIX is holding moderate gains of 7%, but still resides in the mere 12s. Micro chop... as expected. With nothing much due this week... its going to be a quiet one. Not sure if the algo-bots are reading my earlier 'doom' post on DRYS.. but since I posted.. its now lost the $1 threshold. DRYS has never traded <$1 in its ten year history. A real ugly drop of -19%... are rumours of bankruptcy starting to circulate? Lower oil prices... overall.. a major problem for the shipping industry. So.. we're a little weak, but overall, is it nothing for bears to get excited about. 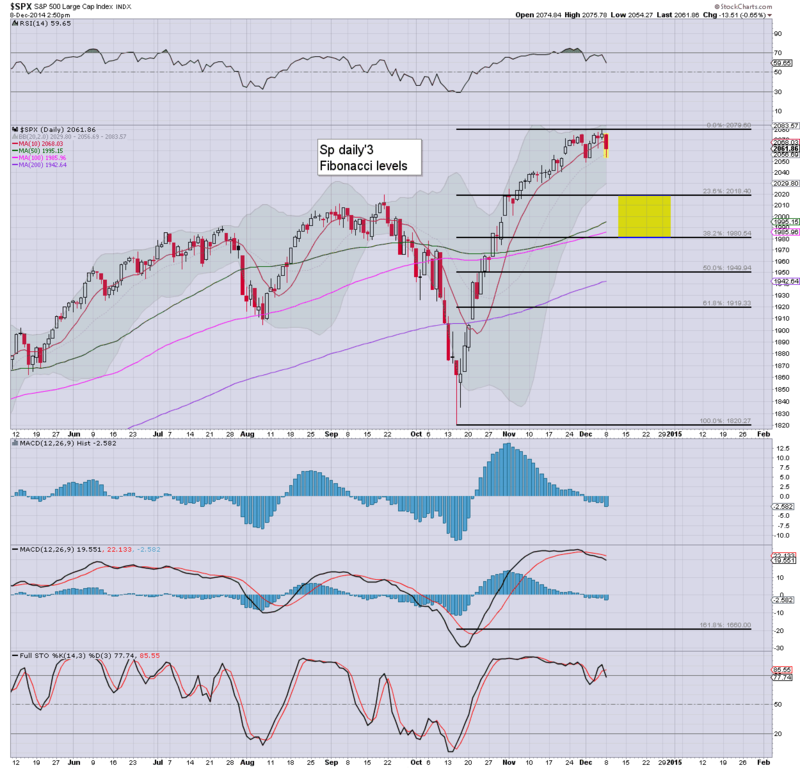 Even a retrace to the giant sp'2000 threshold looks difficult by year end. 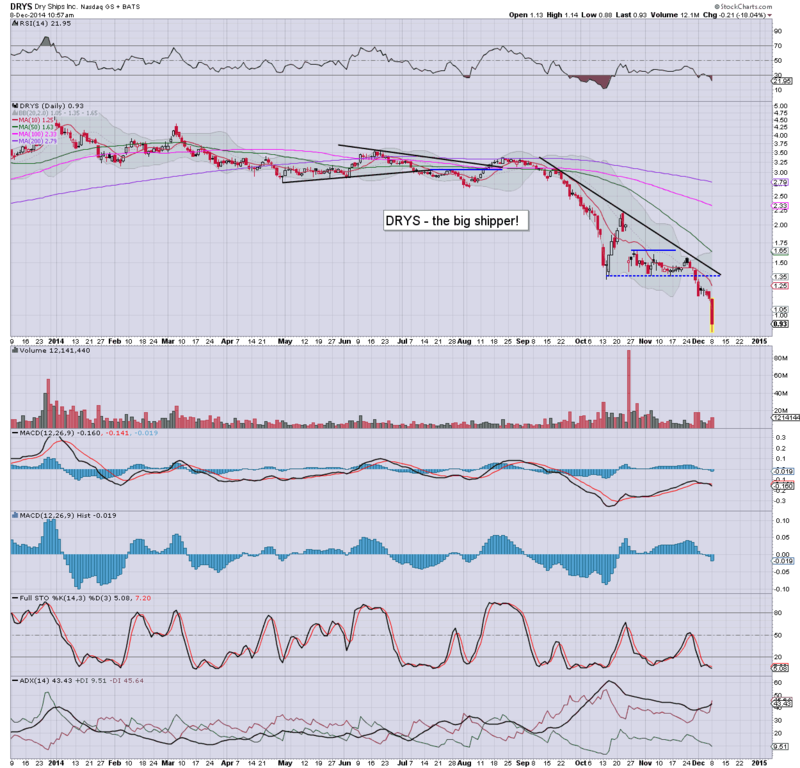 DRYS -6% @ $1.06... set to lose the $1 threshold by year end. Mr Market is clearly suggestive that this company is in danger of ending up on the pink sheets! No doubt, a fair few of the penny share pumpers will be involved on this one. 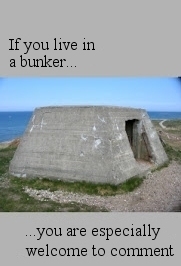 'one for the brave'... you could say. Oil/gas drillers, RIG/SDRL, both lower by around -4%. 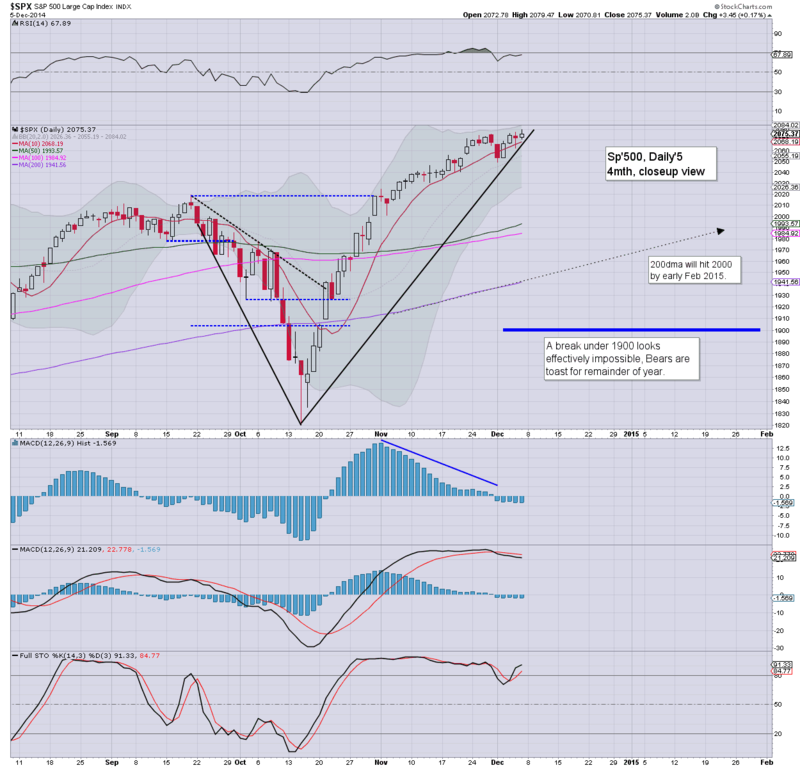 Outlook into early 2015 remains.... dire. Good morning. Futures are moderately lower, sp -5pts, we're set to start the week at 2070. Metals are bouncing, Gold +$4. 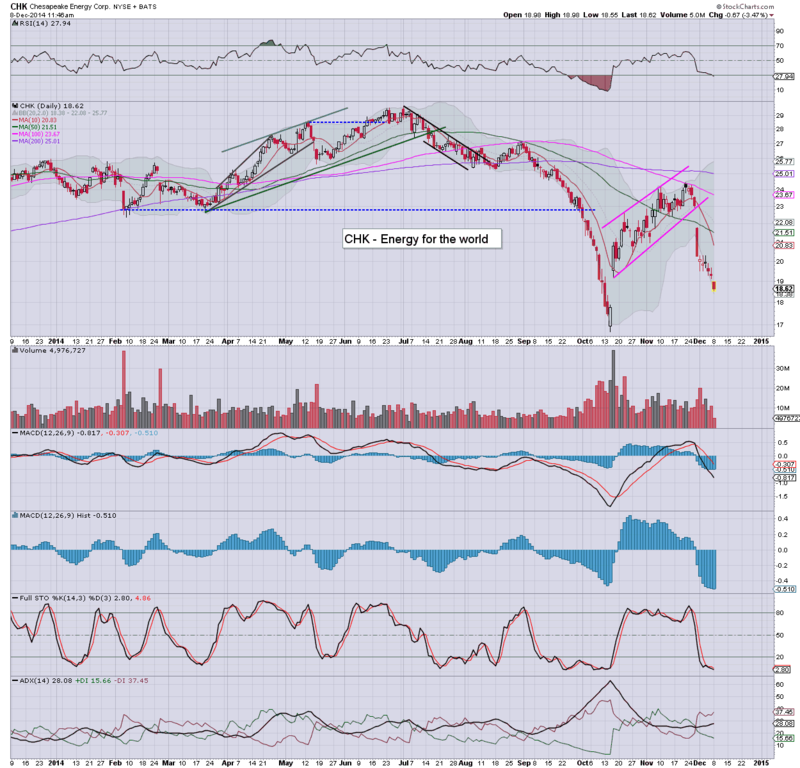 Energy prices remain very weak, Oil is -1.8%, in the $64s, with Nat' gas -3.7% in the $3.60s. Well, here we go again, another week begins. As noted at the weekend though, there really isn't much scheduled this week, and that will certainly favour the bulls. There are minor gains in the airlines, due to lower oil. Maybe this is too heavy to start the week, but it does raise some interesting issues on how most governments are now intent on seizing all wealth from the citizenry. Further, the matter of a global wealth tax... pretty scary stuff. The only way to truly escape... get offworld!